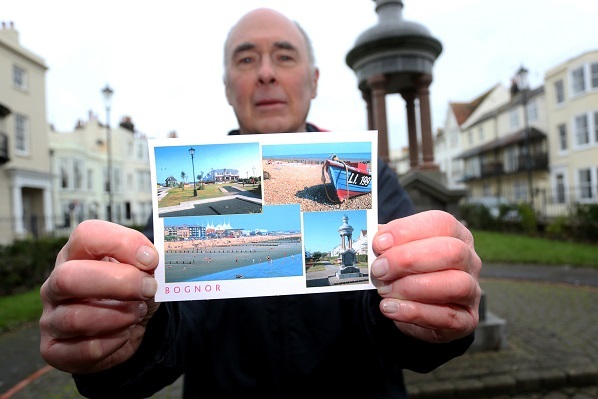 A MAJOR postcard printer has been criticised for missing out the word Regis from its latest postcard of Bognor Regis. Judge Sampson’s postcard features four attractive views around the town in the traditional manner of the greetings cards. But it has left out the all-important second part of the town’s name, which reaches its 90th anniversary this year. Bognorian Anthony Wills spotted the error when he visited the town from his current home in north London. He said: “It’s a shame. It’s a nice card but I thought something was missing when I saw it in the shop and the mistake ruins the card. Mr Wills, 69, grew up in The Steyne, which features in one of the photographs on the postcard. Two views of the seafront and another of Waterloo Square gardens completes the scenes. Mr Wills returns to the town regularly to catch up with his friends. He is also the media relations officer for the National Piers Society and keeps in close contact with events on the town’s pier. “It was the first ever pier I stepped on to. My grandmother would take me on to it just after the war. “We used to go to matinees in the roof garden theatre and it sparked my lifelong love of piers,” he said.